When a friend asked if I was interested in taking a tour of Bob’s Red Mill on a Monday, I decided I could make it a “work-related” event. The boss (that would be me) is a stickler for purposeful hookey. 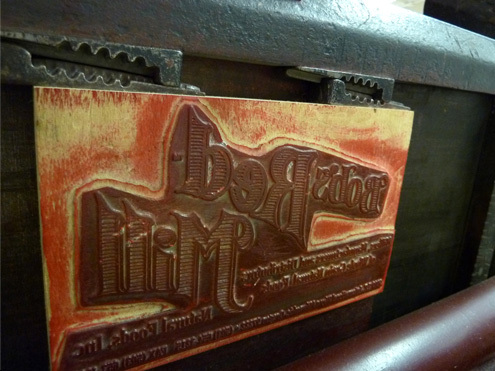 I do write and design a bit about food, especially of the local variety. But Bob needs no promotion from me since his product is sold by every grocery store chain in the U.S. of A. 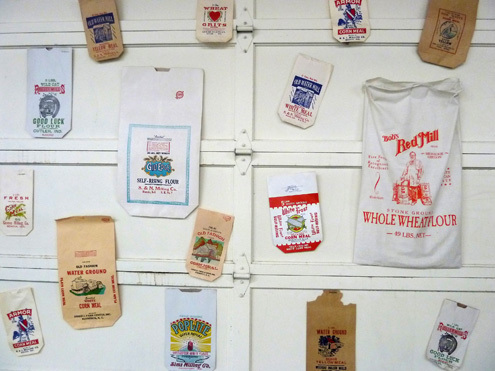 So I was glad to find some visual treats, like this wall of grain sacks. I’d been to the Mill store once before, but not the factory, and did what most people do there. I ate a lot. Then I loaded up on grains and beans and flour. Bob’s bulk bins are like whole grain slot machines. You become addicted to putting bags under the spouts and yanking the lever. You have no idea what you’re going to do with teff or pea flour or chia seeds but you don’t care. With over 400 products, you feel compelled to try at least 25. Better than a tour of the factory—a 300,000-square-foot building in Milwaulkie, Oregon, just south of Portland—was Bob himself. 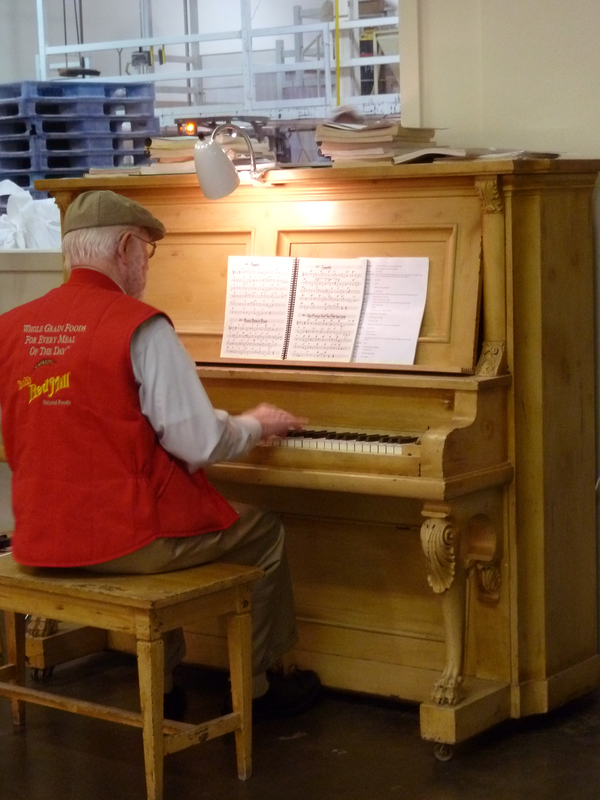 The 82-year-old founder, who goes to work every day, was banging away a little ditty on a piano when I walked in. I don’t know what I was expecting. But certainly not Bob in the flesh. According to friends, Bob is omnipresent around town. Bob reappeared on our tour and boasted about his cholesterol level—121. The striking thing about Bob’s Red Mill packages is not so much the consistency and shelf presence, but that there are so many unusual products—stuff like xanthan gum, arrowroot starch or fava bean powder. When perched next to everyday items like sugar and whole wheat flour, these products take on a normalcy and arouse curiosity. Did I mention they have over 400 products? The designer in me got a charge from some of the historical artifacts lying around. My attention was waning on the tour because of my grumbling stomach (next stop was the Mill store and breakfast!). So instead of paying attention to a story about when the mill burned down, I shot a few photos of old equipment. 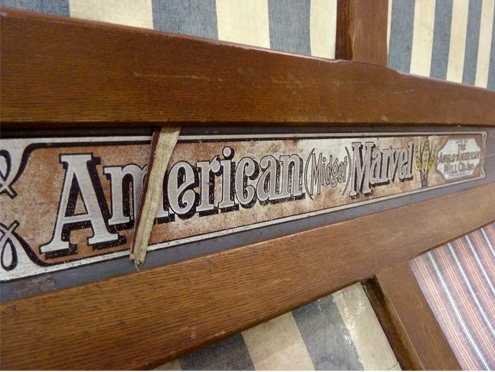 The irresistibly named American Marvel Midget Mill. A self-contained mill from around the turn of the century. 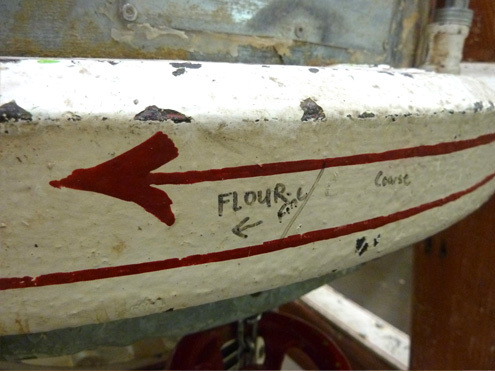 A platen press with a Bob’s Red Mill plate for sacks of grain. came across a book on the subject many years ago. There’s a part of the mill, a tray called a damsel, that rattles and controls how much grain goes into the mill at one time. In the old days, if the miller stopped hearing the chatter (or the damsel’s song), it meant the damsel was in distress. Fiction? I’m not sure. But it made for a good story. 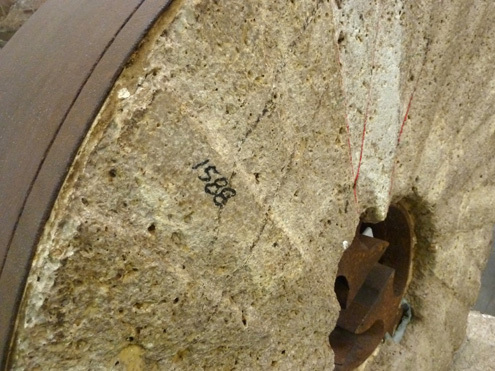 Either way, the old mills were beautiful, the raised type, the etched metal labels, the knobs and bolts and many turny things. This makes three factories that I’ve been to, including Celestial Seasonings and Jelly Belly. I’m fairly sure Jelly Belly was my favorite. No offense Bob. Dill pickle jelly bean anyone? Mutant jelly beans at half price? • Gluten-free products account for one third of sales, all made and scrupulously tested in a separate facility. • Flax seed meal is their number one selling product. Amazing huh? • They have 50 different organic products. • They buy no GMO grains, beans or seeds. • They’re the nation’s largest stone miller. If Bob’s is not enough grain for you, you can hop across the street to Dave’s Killer Bread, a guy who needs no introduction, and buy day old and frozen bread at a discount. And if you’re lucky, maybe you’ll bump into Dave. And if you don’t live here? Well, if I found not only Bob’s Red Mill gluten-free products but also Dave’s Killer Bread in Peoria, Illinois, I’m sure you can find them just about anywhere. oh I love it. Beats the hell out of touring the halls of Congress. All you get from that is cooties – or a bad case of partisanship…. Oh shoot. I wish I knew you were going. I love Bob’s products but am dismayed at the new packaging for organic flour. A plastic type bag has replaced the traditional paper bag. (the plastic bag can’t be recycled) I suppose I should e-mail them–but it would have been great for you to ask them in person! 🙂 Sounds like you had fun! They did talk about their bags but it was the smaller package where they’ve eliminated the sticker in favor of printing in the round on the plastic. I seem to recall they said something about the bag being biodegradable. But now I want to find out. I didn’t see the large flour bag but there’s something iconic about a sack of flour, which begs for fabric or paper. Let’s do some research! Just put in a call to Bob’s and someone is getting back to me. Stay tuned. Thanks for reading, and an early welcome to Oregon!